A team of researchers led by Dr. Jill M. Mhyre, Associate Professor of Anesthesiology at the University of Arkansas for Medical Sciences in Little Rock, conducted an exhaustive study of heart attacks that occur in the delivery room. According to the team's findings, these "high-stakes events" go under-reported in the United States. The reason is thought to be inconsistent reporting systems from state to state. The research team examined data involving more than 56 million hospital births occurring in the United States between 1998 and 2011. The data were derived from the nation's largest all-payer discharge database in the US — the Nationwide Inpatient Sample (NIS). The NIS database is sponsored by the Agency for Healthcare Research and Quality and maintained by the Healthcare Cost and Utilization Project. Federally operated hospitals are not part of the database. Maternal cardiac arrest occurs when a woman's heart stops beating during or after having a child. The event is as dangerous for the child as it is for the mother. 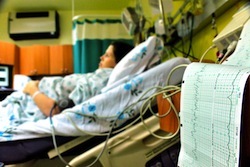 Stillbirth following maternal cardiac arrest is not uncommon. Emergency C-section deliveries conducted within five minutes of the heart attack are crucial for preventing neurological damage to the baby. Of the 56+ million hospital births, 4,843 involved cardiac arrest. Therefore, one in every 11,749 births involves cardiac arrest. Other sources list the number of cardiac arrests at half the rate the Mhyre team discovered. In 1998, the rate of survival to discharge was 52%. In 2011, the survival rate had risen to 60%. 47.7% of the cardiac arrests were triggered by excessive bleeding. 13.3% were the result of heart failure. 13.3% were the result of amniotic fluid embolism. 11.2% were the result of infection of the bloodstream. The demographics of the Mhyre study corroborate a 2012 study that indicated black women are 3.7 times more likely to die than white women from complications of pregnancy. Mhyre describes the 60% survival rate as "good" but says the US rate of maternal mortality is "unacceptably high." She expects her team's findings to provide information that will be of assistance to healthcare providers in delivering the most effective cardiopulmonary resuscitation measures available for women in labor. Because two lives are at stake, Mhyres considers it especially important that obstetrics teams are prepared to act quickly and efficiently when cardiac arrest occurs. According to Mhyres, "Fortunately, physician anesthesiologists are experts in leading resuscitation teams for maternal cardiac arrest and other emergencies that happen on the labor floor." Source: Mhyre, Jill M, MD, et al. "Cardiac Arrest during Hospitalization for Delivery in the United States, 1998-2011." Anesthesiology. American Society of Anesthesiologists / Lippincott Williams & Wilkins. Apr 2014. Web. Apr 1, 2014.